We use digital interfaces ubiquitously in India and elsewhere resulting in cultural productions that look and feel different from the ones in the last century. Consequently, as with every technological advance, the production and consumption of literature also undergoes paradigm shifts. We are at such a time in our society – and there are various and varied forms of poetry, literature, digital art, twitterfictions and other forms that have emerged at the intersection of technology and creative expressions. And there is not yet an anthology of Indian electronic literature. What are the kinds of electronic publishing that is done in India? In which languages? How is it similar or different to electronic literatures published elsewhere? 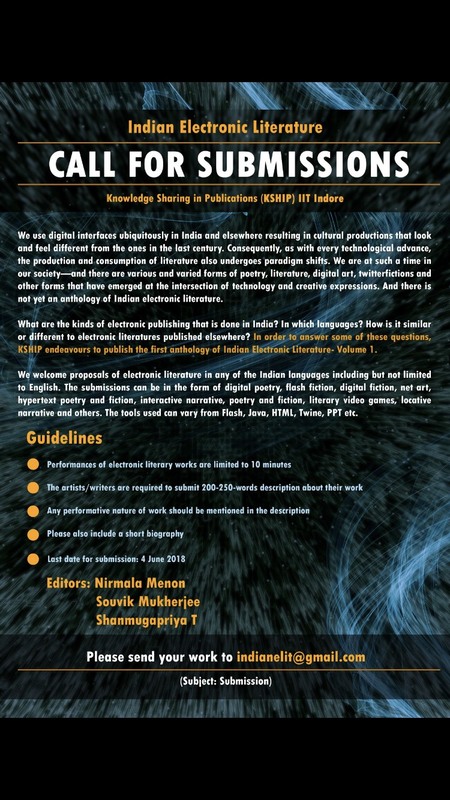 In order to answer some of these questions, KSHIP endeavours to publish the first anthology of Indian Electronic Literature – Volume 1. We welcome proposals of electronic literature in any of the Indian languages including but not limited to English. The submissions can be in the form of digital poetry, flash fiction, digital fiction, net art, hypertext poetry and fiction, interactive narrative, poetry and fiction, literary video games, locative narrative and others. The tools used can vary from Flash, Java, HTML, Twine, PPT etc. The Indian Institute’s of Technology Knowledge Sharing in Publishing (IIT KSHIP, https://iitikship.iiti.ac.in/) is an Open Access publisher of peer reviewed open access books, journals and other forms of academic publishing. We are part of Ubiquity Press’s (http://www.ubiquitypress.com/) partner network of university open access publishing. 2. To host peer reviewed journals from academic societies primarily in India. KSHIP maintains rigorous international peer review standards with an Advisory and Review Board that meets the highest standards of academic research. KSHIP primarily publishes academic and scholarly journals and monographs in English; however, one of the strategic goals of KSHIP is to initiate and sustain a multilingual scholarly publishing platform. 2. To solicit and publish original monographs in Indian languages. As IIT Indore is based in Madhya Pradesh, we will begin with Hindi but will add other languages, as we expand and add experts from different languages on our team. For more details, visit our website https://iitikship.iiti.ac.in/ . •	Environmental Humanities and other allied areas. We accept manuscripts in English, however, KSHIP is committed to being a multilingual scholarly publishing press and therefore welcomes translations and original scholarship in languages other than English. Currently, we consider manuscripts in Hindi (and will add other Indian languages soon). We are particularly interested in translations of scholarly works in the fields of Science and Engineering and would welcome proposals in the area. KSHIP will also host peer reviewed academic journals (that will involve a nominal cost of hosting and publishing costs). All of our publications will be peer reviewed by an international team of experts. The decisions of the editorial board with regard to manuscript acceptance will be final and binding. If you would like KSHIP to consider your proposal for a book or journal please download our proposal submission form from our website and send it to kship@iiti.ac.in. Alternatively, visit our website https://iitikship.iiti.ac.in/ and use the "Publish with us" button at the top right to be redirected to our Book Management System. Register as author and submit your proposal online. Proposals are reviewed by the editorial team at KSHIP to ensure that they fulfil the requirements, interests and mandate of the publishing team. Proposals that meet the criteria of scholarly publishing of the KSHIP editorial team will then be sent to at least two external expert reviewers for feedback and comment. The proposals will be reviewed for originality of content, innovativeness, relevance to the field (to be determined by external experts) and the intended target audience.